In the olden days, pound shops were a rarity and usually called themselves, rather frustratingly, "pound plus" shops; indeed Poundland (the current giant of pound shops in UK, fondly known as the pand shop) has its own share of £2, £3, £5 and even £10 offerings. However this post will refrain from a discourse on the evolution of pound shops and when a pound shop is no longer a pound shop. Because, here is a beauty product - and it is - in fact, just one shiny pound! Previously this happily sold for £6.99, and having now tried it a few times, I honestly would have felt that even at full price it was a good purchase. It's a very Kate Moss colour so it doesn't feel like a cheap celeb cash-in. I've always adored Kate Moss' makeup and the way that she is not afraid of colour, she just wears it on her own terms. Her fashion and makeup choices always look like she is the one in control - all too often a wild colour or outfit can look self-conscious, or worse, like it's wearing you! But never with Kate Moss. It's not a bright emerald but rather a smoked out and blackened emerald. Still, it has an unmistakable jewel tone to it and I love it for the summer to wear instead of a black. 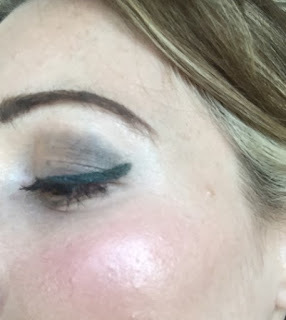 It's really hard-wearing and even in our current heatwave it has not smeared at all. 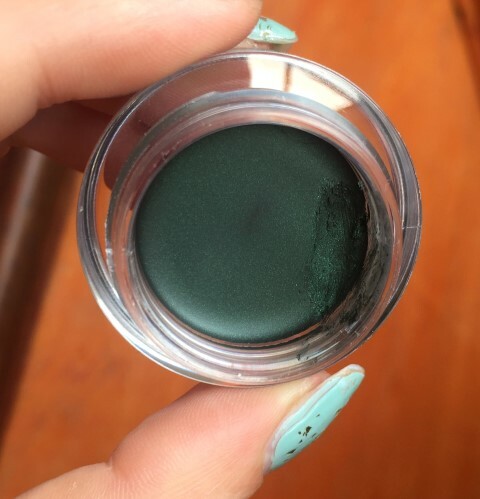 I've only used it as a liner but I expect it would work well as a base to a smokey eye. (In the picture below you can see all my eyeshadow has pitifully smeared and creased but the liner has stayed as true as it was when first applied.) 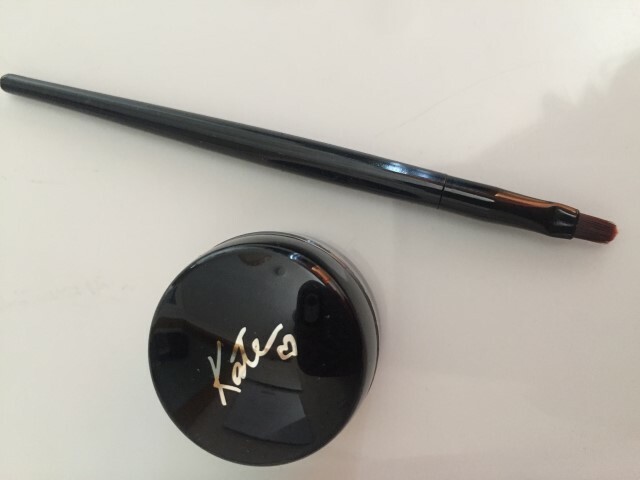 The brush included looks worthless and was tossed in the bin; I prefer using a Louise Young eyeliner brush. The other negatives are the plastic pot which, although very cute, is rather flimsy and may not keep the gel fresh, and also the fact that this does say "Made in China". At the time of writing, my local Poundland had at least 5 still left on the shelf. Sadly, it doesn't seem to be available online. If anyone has any trouble getting one or is overseas, perhaps I can do an extravagant giveaway contest... If I can get any more. Let me know in the comments if you've tried this, or what other finds there are for a pound?